In a small bowl, toss together the blueberries and raspberries with orange juice and sugar. Let the berries marinate in the mixture for about 20 minutes on your counter. To make the whipped “fool”, whisk the whipping cream with a hand mixer until soft peaks form. Add the honey, sugar, and vanilla and continue to whisk until it becomes the consistency of cool whip. Remove the berries from the bowl with a slotted spoon and add to the whipped “fool”. With a spatula, gently fold the berries into the whipped ”fool”. 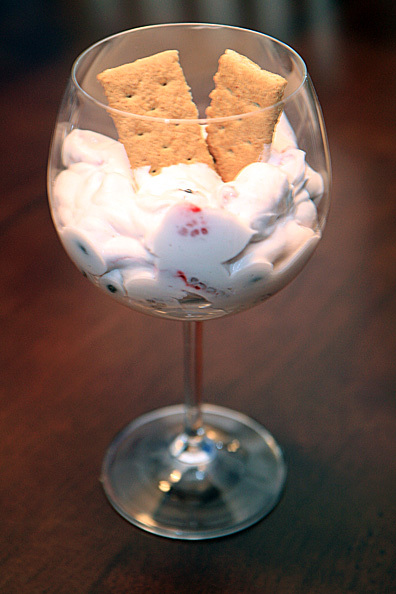 Pour into a serving glass or dish and serve with graham crackers, either crumbled over the top or break them into planks and use them as a scoop.